Christianity is a surprising religion. It has changed the world in remarkable ways throughout history simply through Christians living out their faith. More recently, we've become afraid of a habituated Christianity, thinking that routines will rob our faith of its vitality. The net effect is that we've replaced the habits that surprise the world with habits that mimic the world?and both we and the world suffer for it. Integrating the five habits in the BELLS model?Bless others, Eat together, Listen to the Spirit, Learn Christ, and understand yourself as Sent by God into others? lives?will help you spread the gospel organically, graciously, and surprisingly. 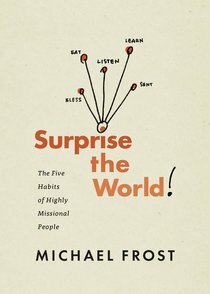 About "Surprise the World: The Five Habits of Highly Missional People"
Michael Frost (D.Min) is Vice-Principal and Professor of Evangelism and Missions at Morling College in Sydney, Australia - and a Baptist Minister. He is the author of Exiles: Living Missionally in a Post-Christian Culture; Jesus the Fool: The Mission of the Unconventional Christ; Seeing God in the Ordinary: A Theology of the Everyday and the co-author of The Shaping of Things to Come: Innovation and Mission for the 21st-Century Church and ReJesus: A Wild Messiah for a Missional Church.